Well, there’s nothing official yet, but Schleifer at the Chron cites “sources” as saying that Sheriff Adrian Garcia will announce for Houston Mayor in another month. I’m sort of with Kuff on this in that it really is sounding like a broken record; not Garcia’s record player, but everyone elses. But, what if it’s really true? I’m sure the Democratic freak-outs will continue over the Sheriff’s imminent resignation, leaving the Republican county commissioner’s court to appoint a right-winger to the post. I’m sure none of us wants a right-winger as Sheriff who will roll back any advances Garcia has pushed forward. And for those who have a beef with the Sheriff over his deportation record given his support of 287g and Secure Communities, I’m pretty sure we’ll be debating immigrant tent jails and pink striped jail uniforms soon with a Republican in office. Still, nothing is forever, and if Garcia wants to move on to another position, that’s his right. Who knows? He may become your favorite candidate for Mayor if and once he rolls out his plan for Houston. I will add that recently, Sheriff Garcia came out against SB185–the legalized racial profiling bill that was debated on Monday. Of all the unofficial and official candidates, Garcia is the only one who has offered a take on a bill that would affect the City of Houston quite negatively. 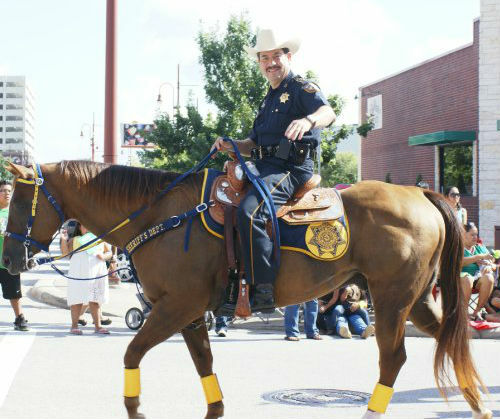 That said, until I get a embargoed press release from his team, he’s still Houston Harris County Sheriff Adrian Garcia. PDiddie has some questions for the Sheriff. This entry was posted in 2015, City of Houston, Elections and tagged 2015, Adrian Garcia, City of Houston, houston sheriff, mayor. Bookmark the permalink.